There are two kinds of church leaders … those who worry about finances and those who lie about not worrying about it. Led by Generous Leaders // Churches with increasing generosity are led by leaders who are increasing their own generosity. You simply can’t lead people to a place you’re not willing to go yourself. When David raised resources for building the temple, the leaders gave first. [ref] That principle echoes in our churches today … as leaders we’re called to be generous first. If your church’s revenue is lacking, ask yourself and your leaders about your own generosity. Thank First-Time Givers // When someone gives to your church, what happens next? Churches with increasing generosity have a simple system built around thanking first-time donors. People who give to your church choose from a wide variety of options for giving … show some appreciation. They are raising their hands to show they want more connection to your church. Give them information about taking some next steps. Go out of your way to ensure they understand how important their giving is to your church! Connect Giving to Vision // When people give to your church good things happen. It’s your job to communicate that connection on a regular basis. Connect the dots to show how giving makes a difference in people’s lives. Talk about it before you receive the offering every weekend. Send donors regular communications that show their giving making a difference. 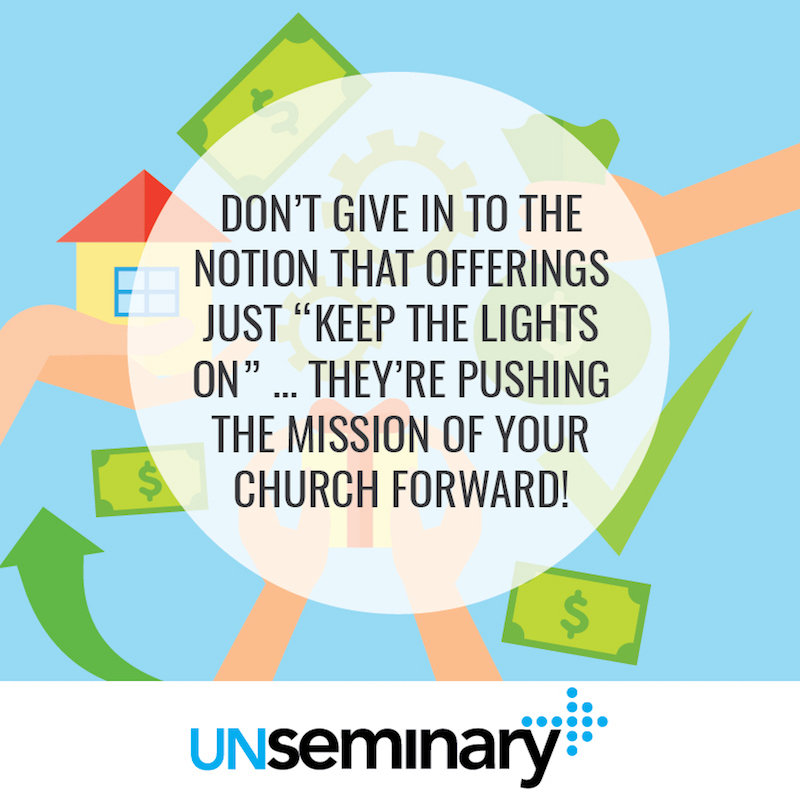 Don’t give in to the notion that offerings just “keep the lights on” … they’re pushing the mission of your church forward! Move People to Digital Giving // Churches with a robust generosity culture find ways to move people away from traditional giving avenues (e.g., envelopes in service, mail-in offerings) and toward digital giving platforms. Regular recurring offerings given through electronic fund transfer or credit/debit card payments are the foundation of a solid revenue stream. Practically speaking, when people travel or are away from your church for a number of weeks, they are still able to contribute to the mission. As well, people are used to more financial transactions done through these online channels than ever before. Leading churches are moving their regular donors to these platforms. Stratified Communications Strategy // There are people in your church who have the gift of giving. As with any other gift, you need to help people grow in using it. [ref] Some church leaders shy away from engaging this group of people because they don’t want to show signs of favoritism — that instinct is a good one! However, it is your role to equip and grow everyone regardless of their gifting. There is also a group of donors who represent a disproportionate amount of your church’s offerings. It’s your responsibility to care for these people in a way that helps them grow as well. Churches with increasing revenue embrace these two realities. Their communication strategies use different tools, approaches and tactics for various “donor types” within their churches. Rather than communicating the same way to everyone, these churches nuance their approaches based on the people they want to reach. Leverage Special Campaigns // Whether it’s traditional capital campaigns launched every few years or annual giving campaigns like Christmas Funds or other unique giving opportunities, churches with growing revenue create “above and beyond” opportunities for people to give to the mission of the church. These special campaigns are time bound and vision critical. It’s a healthy process to lead your entire staff and community through the process of articulating, communicating and executing giving opportunities that push the mission of the church forward. Often these special campaigns end up breathing spiritual vitality into a church while increasing its impact.